Cool demo for gba. Good graphics and effects with decent music. Just amazing! I didn't even know there was enough power in GBA to do stuff like this. :) Cool drum'n'base track sums everything up and all in all one of the best entries in the mobile demo competition. My favourite in the mobile compo. Smooth and coherent, with some CNCD twist. Saw it on some Unique guy's GBA already on Thursday, designs like this have been seen in demos a hundred times but the effects and gfx were cool and it looked like a PC or an Amiga demo. word up guys! one of the best GBA demos I've seen. really good stuff even if some effects and are VERY similar to some DCS demos on Amiga (namely Klone and Beats)... like those blue squares. beats are by loveboat althought DCS shared some members with it + Adam was cooperating with 'em. will check this one out and then perhaps say something more. The best GBA demo in the compo, and one of the best I've seen so far, too. A very nice GBA demo, nice dnb soundtrack and sweet gfx.. good work. cool music and some code. this makes me angry! Optimize your code!! And don't test your stuff only in emulators! It bugs and is slow on the real GBA! Don't you know you're not allowed to write one byte at a time to VRAM?! Read the docs damnit! Inopia: you're absolutely right :/ but you can expect better gba releases coming from us in the near future. yeah, the left-bottom screenshot is rather similar to some part of klone. but what the heck, that doesnt make it any worse.. its very good stuff we can have on GBA with this.. must! 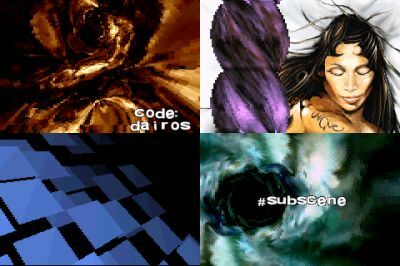 Nice design/effects to be a gba demo, especially some bitmap deformations. My favourite demo on gba so far. Good effects, but horrible size optimization and a few effects that could be faster. cool gfx and music. nice flow..
Not bad but the effects are rather simple and there are too many table effects as lsl said. Most of scenes are nice. "But where is Vit 1?" page created in 0.018651 seconds with 15 queries.